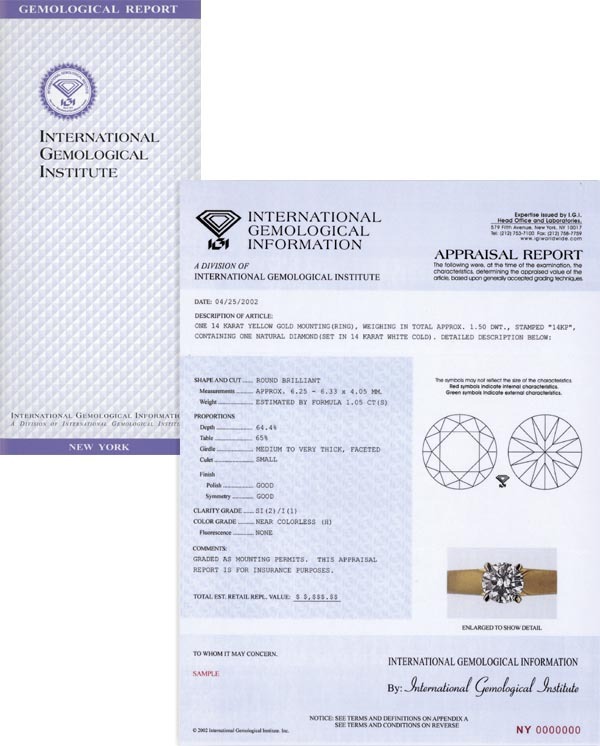 International Gemological Information, a division of IGI, was established in New York in 1981, as a source for unbiased appraisals of gems and jewelry. 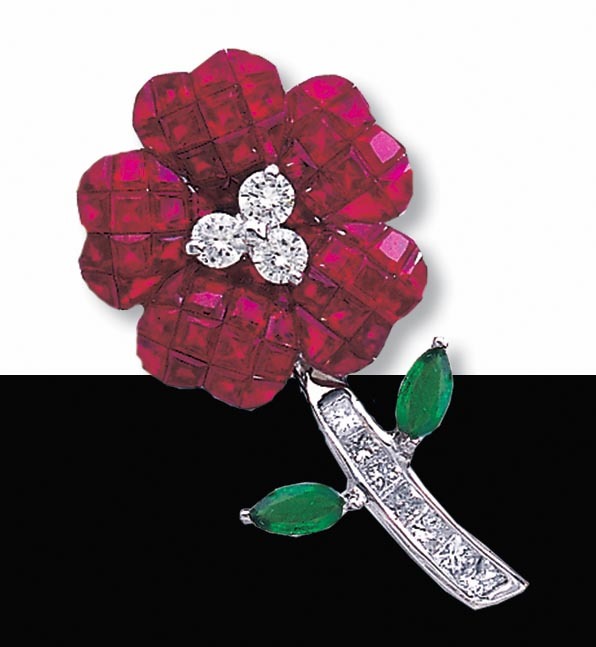 IGI is totally independent of all commercial sales organizations and does not trade in diamonds or precious stones. Thus, IGI is able to provide objective and accurate appraisals and identification reports, as well as appraisal updates and estimates in case of damage. These monetary valuations are based on a constant surveillance of current retail prices through the use of a computerized network. This network monitors a cross section of the pricing structure throughtout the world by means of national and international surveys. I.G.I. 's Appraisal Report provides a description of the gem or article of jewelry- its identification, weight, measurements, shape, cut, finish, proportions. clarity, color, and when approriate, the quantity of precious stones. Also included are the identification, content, and weight of precious metals. Enlarged colored photograph, and in the case of diamonds a diagram indicating inclusions, if any is also provided (0.95 ct. and above). Finally, the Appraisal Report states the estimated retail replacement value for insurance purposes. Consumers, retailers, jewelers, insurance companies, public accountants, financial planners, and estate executors are assured of the the most reliable an accurate Gemological Appraisal Reports available today, thanks to IGI's advanced technology and superior expertise in the field of gems and jewelry. 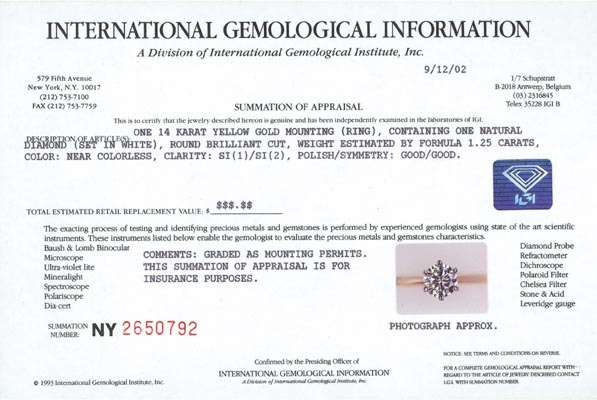 International Gemological Information's experience appraisers convert the grading information of gems and jewelry into retail replacement values for insurance purposes. These results are based on continuous international surveys of retail prices charged by established retail stores. The Summation of Appraisals (S.O.A.) 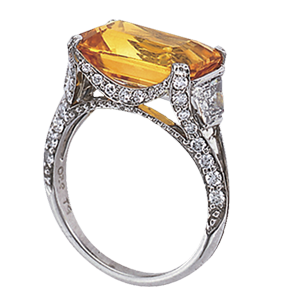 will summarize each article of jewelry's pertinent gemological factors. Experienced graduate gemologists working in unison with certified, accredited gem and jewelry appraisers independently examine each article of jewelry. These gemological factors include the authenticity and weight of the precious metals, identification and the quality of diamonds. A color photo of the article is also included with each summation. 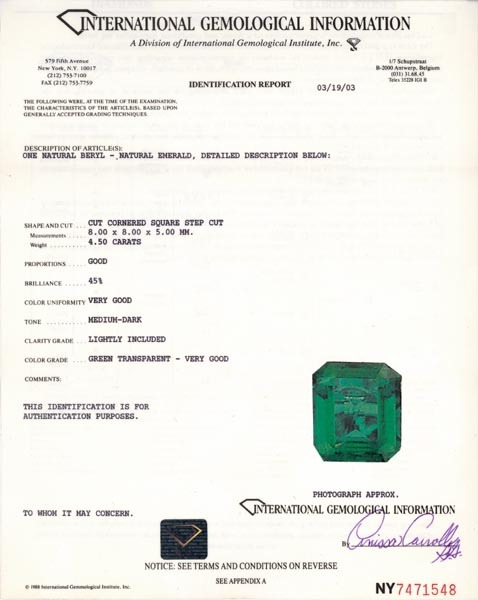 IGI's seal of inspection will be attached to each article of jewelry appraised and upon request, the unique S.O.A. number and IGI logo will be engraved into the shank of the ring for identification purposes. IGI's Summation of Appraisal is available in several formats. The computer generated micro-cert fits perfectly into IGI's jewelry box, thus making for a great presentation. Another format is IGI's new Appraisal Summary. This credit card sized format is available in a passport holder. The IGI Identification Report provides a description of gem or article or jewelry including its identification, weight, measurements, shape, cut, finish, proportions, clarity, color, and where appropriate, the quantity of precious stones. Also the identification, content and weight of any precious metals are stated. To further identify the item, an enlarged color photograph is provided, which shows the details of the article of jewelry. In addition, diamonds are diagramed and any inclusions are indicated. These reports are ideal for professionals and consumers who desire a permanent record of the actual identity, authenticity and quality of a particular article of jewelry. Identification Reports may be converted into Appraisal Reports upon request. A Certificate of Authenticity describes a submitted article of jewelry and assures the retail client an independent professional gemological laboratory has officially authenticated the identity of gemstones and precious metal included in an article of jeewelry. The certificate will display a color photograph of the article for identification purposes. A certificate number is included in case the item is lost or stolen. All of the particulars concerning the article will be held in IGI's central computer bank. To answer the demand for credible, independent diamond grading in a time sensitive and cost effective manner, I.G.I. 's Limited Inspection Reports provide independent documentation as to a minimum color and clarity based on the internationally accepted system for diamond grading. Turnaround time is 24 hours or less and the fee is nominal. A sample must be submitted prior to inspection. Minimum quantity is 500 of the same style. If an item passes the requirements, an I.G.I. seal of inspection will be affixed to the item of jewelry as well.